Kindly view the attached message and act accordingly. In reference to your response email dated 9th January 2018 reconfirm your beneficiary account in Taiwan forwarded to us from Societe Ivoirienne de Banque (SIB) as correct was received and noted. However, following the banking edict of article section 45, sub section 028 amended in 2009, we have forwarded your file to the Asia Clearing House for remittance clarification and you will contact you as per request of Forms CSD and EFT to enable your transfer approved. In order to continue with the processing of transfer Ref: 9645/SBFR/057/017, the CDS and EFT as to be approved by the ACH manila Philippines. 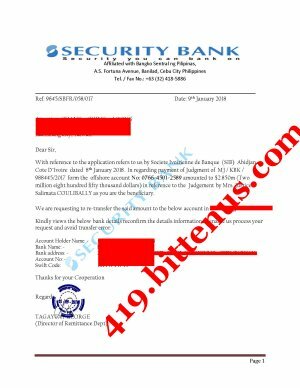 Your beneficiary transfer details as being forwarded to us from the Security Bank with Ref: 9645/SBFR/058/017 for crediting clearance confirmation to Taiwan from the Societe Ivoirienne de Banque (SIB) Abidjan Cote D`Ivoire with sum of $2.85m. In accordance with following banking edict of article section 45, sub section 028 amended in 2009 you are hereby advised to come down to the foreign section in 6th floor of the cooperate building at the below address to obtain forms CSD and EFT fill and legalized it in Supreme Court here in Manila, Philippines and submit back to enable us instruct the security bank to allow crediting the said amount to your account nominated in Taiwan. In alternative, whereby you are not be able to come down to perfect the necessary papers you can appoint an accredited / residential financial Attorney in manila, Philippines recognize by ACH and notable within the financial bank sector that can perfect the said documents on your behalf or contact Asia Clearing Attorney below for assistance.